FICEP Takes Plate Processor Productivity to a Level Never Previously Attained: 40% Productivity Increase in the Same Footprint! 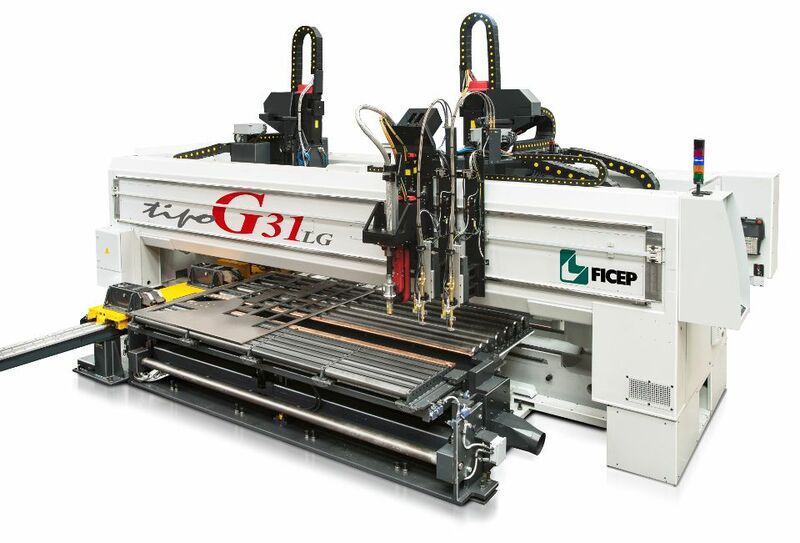 FICEP has been engineering and manufacturing innovative CNC plate processors solutions for decades. This has resulted in the most diverse product line of plate processor available on the market today. The most recent product development of the Tipo G represents the type of quantum leap in productivity that has never been realized previously anywhere in the world. 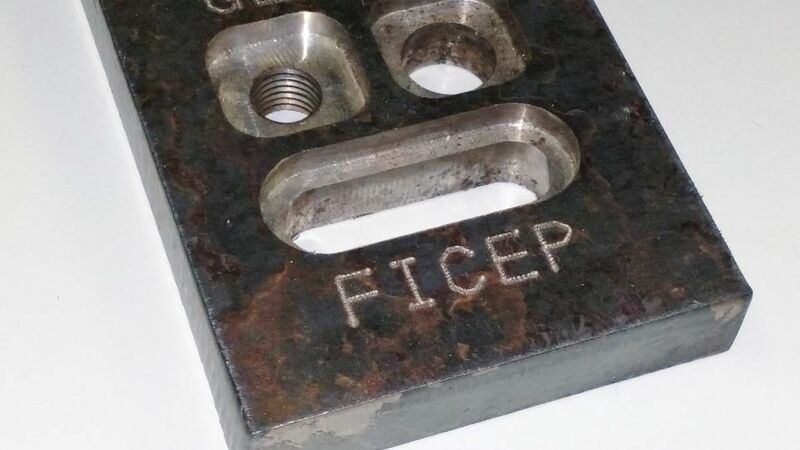 FICEP currently manufactures both gantry and pull through style plate processors, as no one solution is ideal for all applications and industries. 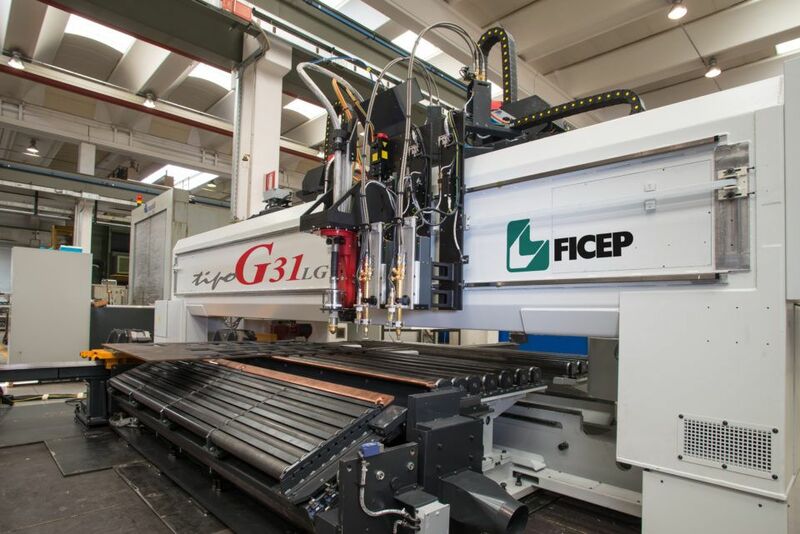 This type of diverse product experience enables FICEP to combine many of the unique features of both styles of plate processors to develop a real “Hybrid Solution” which is the Tipo G.
How can the Tipo G generate a 40% increase in productivity? The Tipo G starts with a double bridge frame construction where the “Direct Drive” spindles are incorporated within the two bridge frames for enhanced stability. Each spindle within the Tipo G double bridge has its own sub axis positioning in the system “X” or length axis. This provides the fastest “chip to chip” time possible as the spindles can be positioned in milliseconds rather that have to position a plate that weighs tons. The full independence of each spindle with its own sub axis positioning enables full independence of operation and function. For example, one spindle could be scribing while the other spindle is drilling, milling, scribing etc. This total and full independence of each spindle doubles the productivity of the Tipo G when performing spindle operations such as drilling, milling, scribing, counter sinking, counter boring and tapping. The sub axis positioning of each spindle not only reduces the chip to chip time to the minimum but both spindles are generally fully productive as the required operations do not have to share the same “X” or length axis coordinate. The utilization of the independent sub axis enables both spindles to be productive which is not possible on dual spindle plate processors without a sub axis. The diverse versatility of the Tipo G is reinforced with the ability to have up to 48 different tools available with its integrated automatic tool changer. 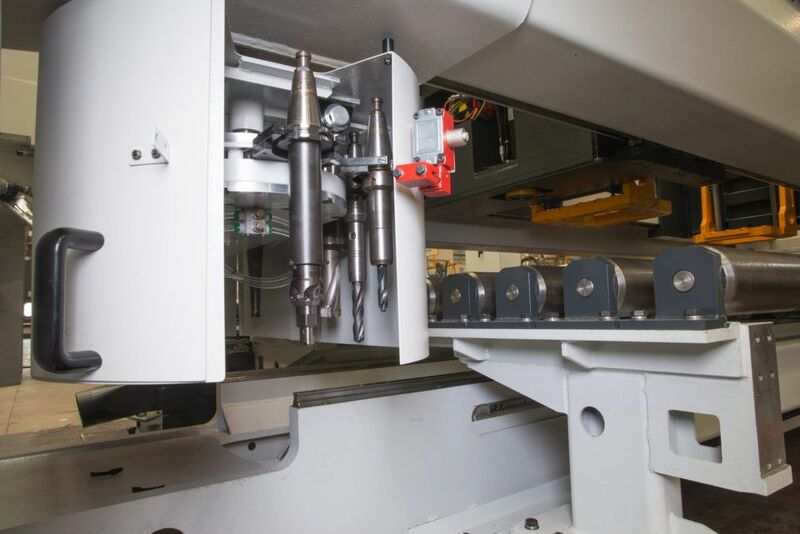 This expansive number of tools that are available enables the Tipo G to address the full complement of operations such as drilling, milling, scribing, counter sinking, counter boring and tapping. Drill chips are automatically removed thanks to the on-board brush, which allows to clean the plate being processed, before starting the thermal cutting operations. Chips are then transferred and unloaded through an automatic conveyor. Plates up to 4” (100mm) in thickness and 10’ (3000mm) in width are secured with multiple material positioning clamps that are hydraulically activated. Once clamped all positioning is achieved with a positive rack and pinion system to achieve industry leading accuracy and repeatability regardless of the condition of the material surface or the edge condition of the plate. The material clamps can automatically be repositioned to accommodate longer plates and to achieve greater material utilization by generating parts in the area of the stock plate where the clamps were previously engaged. This feature also reduces the system footprint to the absolute minimum. 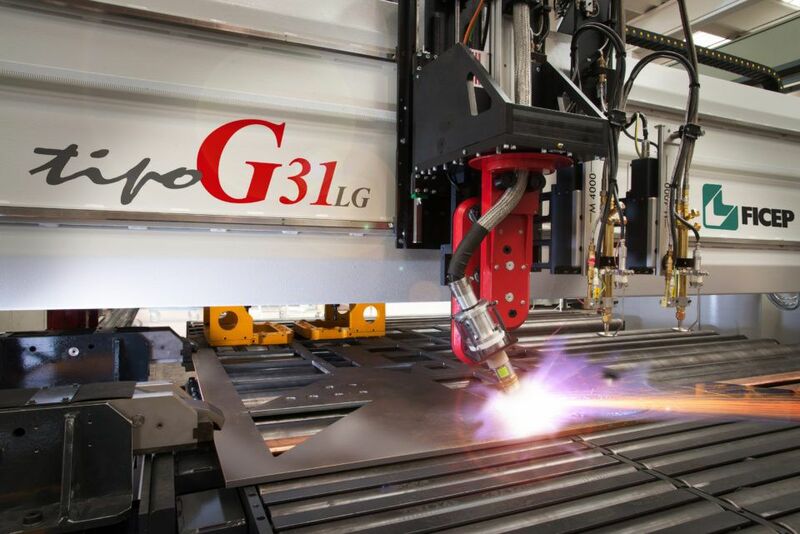 The Tipo G can be equipped with two oxy-fuel torches to address the cutting of plates up to 4” (100mm) in thickness. 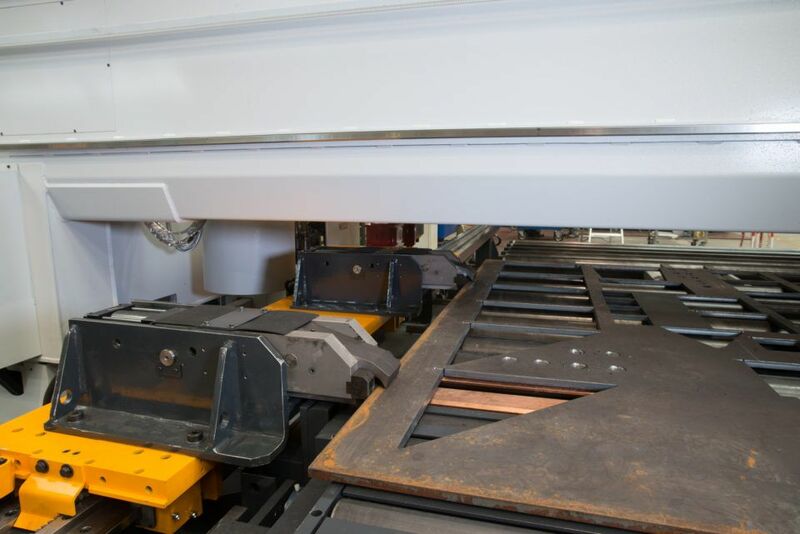 The capability of the system can be expanded with the programmable bevel cutting option in conjunction with a wide selection of Hypertherm plasma cutting options such as the XPR 300. The productivity can be further expanded with the addition of a second plasma torch option (straight or bevel) for those applications that require extensive thermal cutting. Integrated into the exit system of the Tipo G is a parts unloading system that enables completed parts to be automatically removed from the stock plate without operator involvement. A finished parts conveyor can be furnished to deliver these parts waist high to the operator for stacking. Contact us for additional information!